Independence is a lie. For years we’ve been bombarded with independence and examples of doing it on your own. While the allure of the “self-made man/woman” sounds great and makes for cute ridiculous Internet memes, it totally distorts the reality of a successful career. The dictionary definition of “independent” is “not subject to control by others.” Any business owner will tell you how fatally flawed this is when trying to build a brand or reputation. While you may not punch a clock or write your own checks, your livelihood is very much dependent upon customers who patronize your business. To that end, things need to be mutually beneficial. Which is to say, interdependent – or, interdependence – is the key to success. 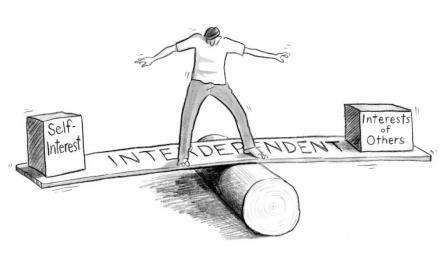 Interdependent is defined as two or more entities “being mutually dependent” on each other. Colleges need students to educate; businesses need customers, and so on. Nobody is totally free from needing someone else – this goes double for those who sign their own checks. My money’s on Designer B, all other things being equal. We refer a lot of business leads that aren’t good matches for us to other agencies and freelancers, and we send them to the people who helped us out in the past. In my current role, I get a chance to work with some amazingly talented young people at an amazing institution. I come back to the term interdependence because my role as public information coordinator is useless without cooperation from co-workers. A couple of weeks ago, we got a last-minute visit from a writer at The Atlantic (yes… The Atlantic). By last-minute, I mean a day’s notice. If I hadn’t built good relationships with my co-workers, the reporters’ visit would’ve consisted of me giving a tour of our facilities. I called in a lot of favors – pulling department chairs away from their duties, corralling our president for a couple of hours, pulling students out of class. The visit was a resounding success. The fruits of that effort can be found here. Whether co-worker, customer or constituent, we are nothing without the teams that help us on the path to success. Nobody can make it out here alone.